Drawing on the combined resources of Vanderbilt University’s Eskind Biomedical Library and Fine Arts Gallery collections, Memento Mori—Looking at Death in Art and Illustration will reveal multiple perspectives on the nature of death and our attempts to memorialize the dead in order to give meaning to their lives. The selection of artwork attempts to create a greater understanding of the role of death and mourning throughout history—a topic that has become increasingly relevant as individuals and communities in the developed world seem to value controlling and delaying death, often unrealistically extending the process for the benefit of the living. Through this collaboration with the EBL’s special collections, the Fine Arts Gallery presents an interdisciplinary approach to our awareness of mortality from the fourteenth century to the present. 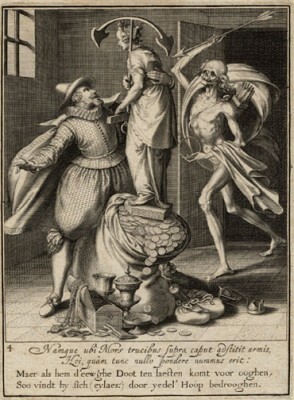 Material featured within this exhibition ranges from art rooted in the Danse Macabre or Dance of Death, the medieval allegorical concept of the all-conquering and equalizing power of death, to deathbed scenes which remind the viewer that, in contrast to the often impersonal experience of death today, the end of life in earlier times usually occurred at home, within a gathering of family and loved ones. Other works reveal approaches to funerals and mourning, including artistic tributes to the dead. The exhibition represents a range of times and cultures and features works by artists such as Andreas Vesalius, Aegidius Sadeler II, Thomas Rowlandson, Hans Holbein, Tsukioka Yoshitoshi, Käthe Kollwitz, Stephen Tourlentes, and Enrique Chagoya. Memento Mori—Looking at Death in Art and Illustration is organized by the Vanderbilt University Fine Arts Gallery and co-curated by Joseph Mella, director, Holly Tucker, professor of French and faculty at the Center for Biomedical Ethics and Society, Christopher Ryland, assistant director at the Eskind Biomedical Library, and James J. Thweatt, coordinator for historical collections at the Eskind Biomedical Library.